Adult brown marmorated stink bug, BMSB, (Hemiptera). Note brown and white banding along the edges of the abdomen and on the antennae. The body is about ½ inch long. The brown marmorated stink bug (Halyomorpha halys) is an Asian species that was introduced into Allentown, Pennsylvania around 1996 from China or Japan. In 2015 it was found in 42 states including Missouri. Its range is increasing in Missouri and is projected to be a major pest of vegetable and fruit crops including apples, peaches and blackberries, as well as, a nuisance in homes where it can overwinter. However, it will not reproduce inside homes or cause structural damage. It can be confused with other stink bugs, notably the brown stink bug, which is smaller and less destructive. Brown marmorated stink bugs (BMSB), like other stink bugs, feed by inserting their mouth parts into the leaves, flowers, buds, fruits, and seeds of host plants and sucking plant sap. 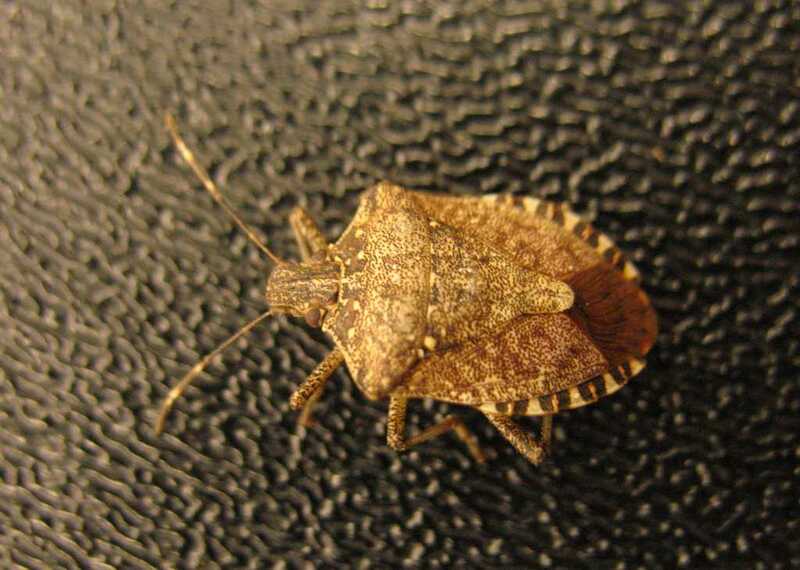 Large infestations of stink bugs may cause plants, especially small plants and young tender growth, to wilt, become stunted and misshapen, or die. Other damage includes yellow or white blotches on leaves; misshapen or aborted fruits, seeds, and buds; calluses, blemishes or depressions; and black pits on nuts. Tomatoes exhibit a condition called cloudy spot (pale yellow spots and a white pithy area just under the skin at the puncture site). Peaches and other fruits may develop scarring and dimpling resulting in cat-facing or a pitted appearance. The seeds in soybean pods may be deformed, small, discolored, or shriveled. Adult brown marmorated stink bugs are about ½ inch long and have the characteristic “shield” shape of stink bugs. They are mottled brownish grey in color with a white or pale gray underside. The antennae and legs have light bands. The edges of the abdomen that extend beyond the sides of the wings have brown and white bands. The native brown stink bug is smaller and has a light green underside. It lacks the bands on the antennae and legs. Adults overwinter outdoors and in buildings and emerge in late March through April when they mate and lay eggs on the underside of leaves May through August. The eggs (about 1/16 inch in size) are light yellow, yellow-red or green and are laid up against each other in clusters of 20 to 30 eggs. The eggs hatch in 1-3 weeks into brightly colored red and black nymphs with banded legs and antennae. They have a “tick-like” appearance. The nymphs begin feeding and progress through 5 instars to adulthood. By the second instar the banded abdominal extension has clearly begun to develop. In northern areas there may be only one generation a year but in warmer, southern states there may be up to three generations a year. In Missouri, there may be two generations a year. In late September into mid-October adults seek protected areas for overwintering. They can gain access into homes through cracks and opening around windows, doors, siding, fascia boards, chimneys, attics or window air conditioners where they overwinter in walls and other locations. In spring, they can be found in interior spaces as they look for ways to reach the outdoor. There are no easy controls for the brown marmorated stink bug, but here are some suggestions for management. 1. Sanitation. Control weeds in susceptible crops and in areas adjacent to gardens to decrease breeding and overwintering habitat. It is important to remove weeds early in the growing season before stink bug populations increase or the loss of habitat may force pests to move into the garden. 2. Collect insects. Hand pick and destroy eggs and bugs. When hand picking, use gloves as dermatitis at the point of contact can occur. Some individuals are also allergic to the smell of stink bugs. Indoors, use a shop vacuum to vacuum up the overwintered adults. 3. Use natural controls. Although there are currently no known natural predators, it is always wise to encourage other natural predators such as parasitic wasps and flies by growing small-flowered plants. The unpleasant odor produced by stink bugs deters many predators but several bird species do consume these pests. 4. Use insecticides. Control with pesticides is short-lived and difficult. Also, resistance to some pesticides has already been observed. If damage is severe and there is a need to save a crop, you can try sabadilla, pyrethrin or permethrin (Eight). Check label directions for suitability with your crop before using. 1. Exclude entry points. Thoroughly seal and caulk entry points to prevent adults from entering structures to overwinter. 2. Use pesticides outdoors. For control of indoor pests, spraying outside walls of buildings to kill adults seeking indoor spaces for overwintering can be done by professionals. Proper timing can be difficult, however, as the effective life of these pesticides is short, resulting in either ineffective control or the overuse of pesticides. The use of pesticides indoors to control adults in walls and attics is not advised as carpet beetles can feed on the dead stink bugs and then attack fabrics in the home. Strategies 1, 2, and 3 are strictly organic approaches. For the organic pesticide choices listed in Strategy 4, consult the Organic Materials Review Institute (OMRI™) for appropriate insecticidal products. Strategy 1 is a strictly organic approach. 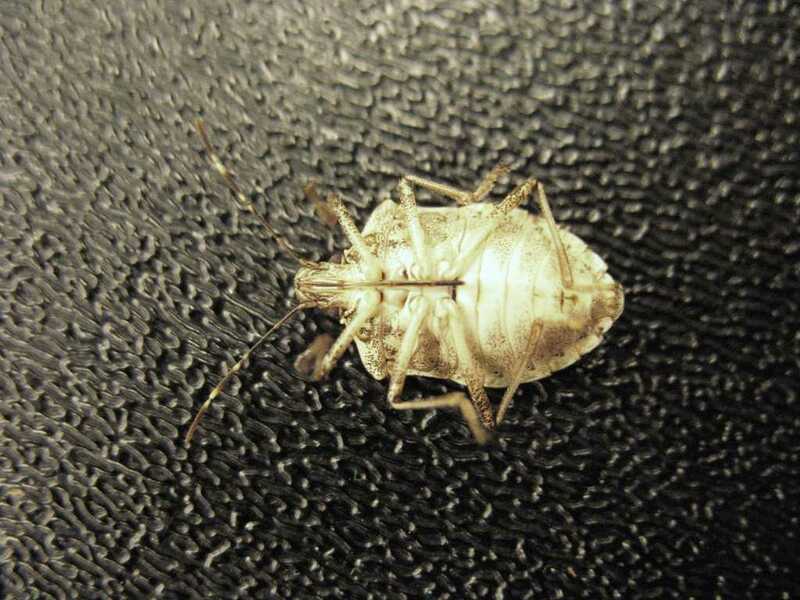 If you find brown marmorated stink bugs in your area, you can help with monitoring efforts by reporting your sighting at https://njaes.rutgers.edu/stinkbug/report.asp. For more information about the brown marmorated stink bug, go to http://www.stopbmsb.org. Underside of adult brown marmorated stink bug (Hemiptera). Note brown and white banding along the edges of the abdomen and on the antennae.